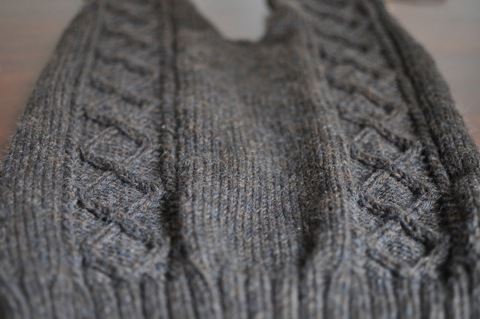 Pransellknit » Blog Archive » On cables, positive thoughts and worsted weight yarn. On cables, positive thoughts and worsted weight yarn. Matt’s jumper, which I mentioned briefly here, has been flying along lately. Although I wanted some respite from the stocking stitch rut I have been in, this jumper has been mostly stocking stitch. Even the cables on the front are surrounded by a heap of stocking stitch. Strangely though, it hasn’t worried me one bit. The yarn has a lot to do with this. Being worsted weight, progress is easy to see and the colour and texture seems to work well with the pattern. Initially I thought the mottled grey/brown would make the twists either side of each cable disappear. However, now that it’s been a while since I finished the front, I think the twists look fine. My concerns about having enough yarn seem to be ill-found (or, my positive thoughts seem to be working). I’m currently working on the second sleeve and am just about to start on the fifth of six skeins of yarn. After the sleeve, I just have to knit up the collar and front placket and it’s done. So, it’s looking like I’ll have some yarn to spare. From this experience, it’s fairly clear that positive thoughts while knitting equals increased yardage. Given my current progress, the jumper should be done just in time for Summer. This shouldn’t be a problem given the weather down here at the moment. It’s likely to be Summer in name only if the cold and wind and rain keeps up. I’m predicting a cold Christmas in Victoria this year, mainly because I’m going to be there and it’s either snowing or 40 degrees when there. It’s like the universe doesn’t think having vegetables in aspic is enough punishment – I have to freeze or scorch as well. Given my prediction, your lovely cabled jumper will come in very handy come December 25. It’s looking lovely Emma. Not long to go now! what beautiful cables. why do they always look so good in grey? just gorgeous. and there is a faint hint of summer here today, hoping it gets your way soon. grey cables. Just perfect. Even browny/grey. It makes my fingers itch to knit and isn’t that partly why we write our blogs? For inspiration. The cable look perfect, perfect, perfect. i love it. I agree with the above, it’s very inspiring. Pouring with rain here too (then again, we’re fast heading into winter, so that’s no surprise! ).